Narasapuram (or Narsapur), is a town in West Godavari district of the Indian state of Andhra Pradesh. It is a municipality and mandal headquarters of Narasapuram mandal in Narasapuram revenue division. 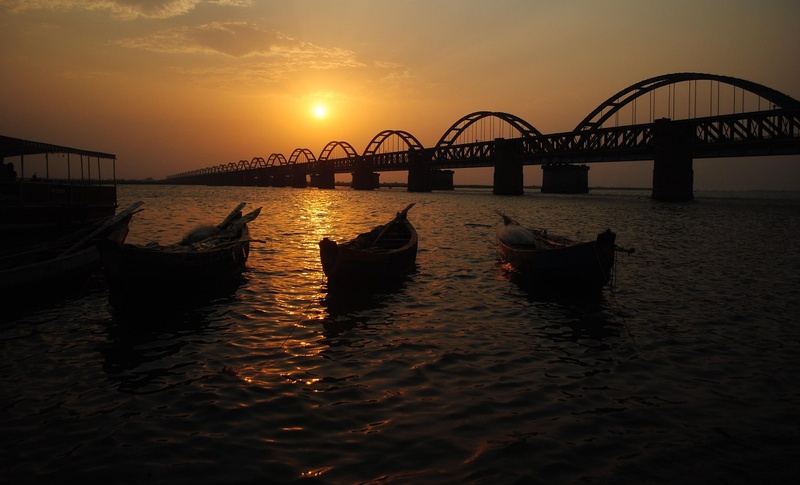 The town is situated on the banks of the Vasista Godavari River. The city exports Lace as the lace industry is more prevalent in the city and its surroundings. The existence of Narsapur dates back to 1173 AD. Dutch people landed in Narsapur in 1626. Narsapur used as a port by the Dutch and ships and boats were built here. It was noted for its ship building activity and some of the Europeans also were customers at this place. Even, though big ships are not built, the craft is still kept up here by building small boats. In 16th century, Portuguese established their own factory which remained as a trading centre for few years. In the 18th century, Narsapur became an important trading port. From this port, teak was exported to other regions. The ports at Kakinada and Narsapuram became famous for manufacturing ships. At present there is no port handling at Narsapur. Madhavayapalem (Madapallam) is celebrated as one of the earliest places where the English established a factory and was famous for its trade in cloth. According to Alexander Hamilton's A New Account of the East Indies (1727): "Next to Matchulipatam (Machilipatnam) is Narsipore, where the English had a Factory for long Cloth, for the Use of their Factory of Matchulipatam, when they manufactured Chintz there. It also affords good Teak Timber for building, and has a fine deep River, but a dangerous Bar, which makes it little frequented." The trade of town has steadily declined since the abolition of the company's factory in 1827. Before independence, British civilians made imports and exports from Narsapur. Godavari Pushkaram is celebrated every twelve years in Narasapuram to take a holy dip in the Vasista Godavari River. This river is said to have been brought in by the famous Maharishi Vashishtha, one of the seven great sages of the Hindu Mythology. The place draws people from the world over throughout the year. Antarvedi, the merging of the Bay of Bengal and Vasista River, which is a tributary of the River Godavari. The place of confluence of the ocean and river is called the "Sapta Sagara Sangam Pradesam". It is also known as the Anna Chelli Gattu (meaning brother–sister embankement). Some of the religious destinations in the town are, AdiKesava Emberumaanar Temple, a Vaishnavite temple of 300 years old which was constructed by translator of the British East India Company, Prasannagresara Puppala Ramanappa Naidu; Christ Lutheran Church is in the Andhra Evangelical Lutheran Church and a member church of West Godavari synod. The Perupalem Beach is located at a distance of 20 km from the town. Roadways: The town has a total road length of 79.67 km (49.50 mi). The Andhra Pradesh State Road Transport Corporation operates bus services from Narasapuram bus station. National Highway 216 connects NH 16 near Ongole, a short route for Kolkata – Chennai route. Railways: Narasapuram railway station is a terminal station located on the Bhimavaram–Narasapuram branch line of Vijayawada-Nidadavolu loop line in Vijayawada railway division of South Central Railway zone. It is classified as a B–category station in the Vijayawada railway division of the South Central Railway zone. Waterways: Narasapur Port is proposed for developing it as a minor port, fishing harbor and ONGC Jetty. Narsapuram Football Club is part of FLOW (Football League Of West Godavari). National level Kabaddi competitions held every year on the eve of Sankranti festival at Kabadi Stadium, Narsapur.